I was shopping at a local market and found a nice looking wild (not farm-raised) pacific salmon, so decided to have that for dinner. I pan-seared it and served it with a lemon dill butter, along with a salad of baby spinach with a lemon mustard dressing. It was an improvisation, but it turned out to be quite good. First, prepare the salad dressing and the sauce for the salmon, setting them both aside until everything is ready to serve. For the salad dressing, mix about a tablespoon of good French Dijon mustard with about a quarter cup of extra virgin olive oil, juice of half a lemon, salt and pepper. Wash and fully dry the baby spinach, then set aside (don’t put the dressing on until just before serving). For the sauce to put over the salmon, mix 4 tablespoons of melted butter with the juice of one lemon, about 4 tablespoons of extra virgin olive oil, and a tablespoon of chopped fresh dill. Cut some lemon wedges to serve with the salmon (for an extra touch, you can get fancy if you want and cut them as shown in the photo). Prepare the salmon for cooking. There’s often a line of “pin” bones in the salmon filet which should be carefully removed using a pair of tweezers or clean needle-nose pliers. Season the salmon with salt and pepper before cooking. Heat a large cast-iron pan over a medium flame. Add a couple of tablespoons of extra virgin olive oil. Turn heat up to medium-high and put the salmon in, skin-side down. Cook it that way for about 4 minutes, then turn it over and cook about another 3-6 minutes (depends on the size and thickness of the salmon filet). Once cooked through, remove the salmon and place skin-side down, then pour the lemon dill butter mixture over it. 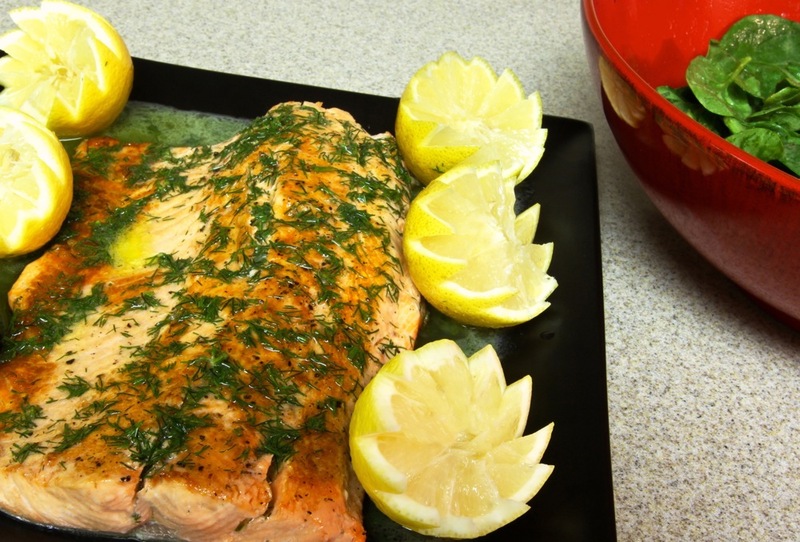 Arrange the lemon wedges around the salmon. Add the salad dressing to the baby spinach and mix. Serve both right away.